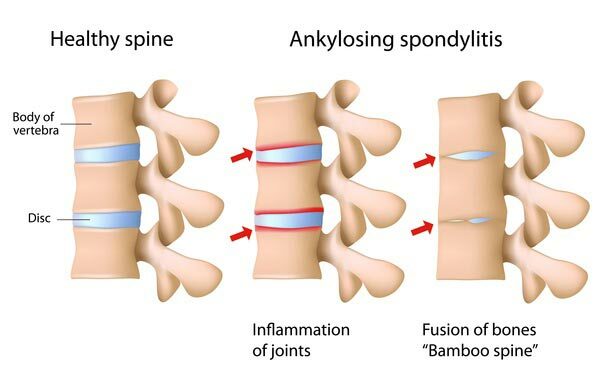 Ankylosing spondylitis is also called as bamboo spine. It's a form of chronic inflammation of joints in the spine and it's associated structures. It usually starts from the sacroiliac joints which are below the waist line and above the tailbone. Inflammation in these areas causes pain and stiffness. Over time, chronic spinal inflammation (spondylitis) leads to complete fusion of the sacrum and the iliac bone. This process of fusion spreads upwards in the spine and the facet joints of the spine and the bodies of the vertebrae also fuse with each other over the next few years. It leads to loss of mobility of the spine. It also spreads to the other joints like hip joints, shoulder joins, knee and elbow joins. Ankylosing spondylitis is also a systemic disease. It can cause inflammation of the other organs, such as the eyes heart, lungs, and kidneys. Symptoms Pain stiffnesss in the spine particularly in lower back and upper buttock area, neck, and the remainder of the spine. Fatigue. The onset of pain and stiffness is usually gradual and progressively worsens over months. Occasionally, the onset is rapid and intense. Reduced breathing capacity. Forward curvature of the upper torso. Causes It can be genetically inherited. The HLA-B27 gene appears only to increase the tendency of developing ankylosing spondylitis, while some additional factors, perhaps environmental, are necessary for the disease to appear. sanjeevan medical yog Treatment - A Robust Cure sanjeevan medical yog Treatment addresses all these problems in this sequence - sanjeevan medical yog Treatment helps to dissolve the recent growth of the bones by using permissible range of motion of that particular region. sanjeevan medical yog Treatment halts the progress of the disease to quite an extent. sanjeevan medical yog Treatment helps to improve the flexibility of patient particularly in the cervical and lumber region.